On the one hand, Kutikai’s Playhouse Desk is reminiscent of a classic cottage from a well-thumbed children’s story book. On the other, the beautiful piece of architecturally designed furniture would be right at home among the glossy delights of a high-end design magazine. There’s little doubt that Kutikai’s Playhouse Desk represents the best of two worlds: imagination and next-level design. 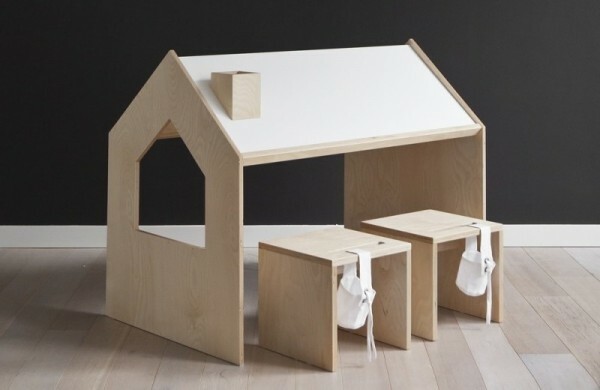 The Kutikai Playhouse Desk (€590.00) is not only an aesthetic delight that will wow kids, but it is a functional, dual-purpose piece of children’s furniture. With a chimney to hold pencils and crayons and a sloping roof on which to rest works of the imagination, the Kutikai Playhouse Desk is a workstation like no other. But, it can’t be all work and no play, right? That’s why this desk doubles as a play hut: airy, stable, eco-friendly, and complete with a window for daily market stalls. The mums-turned-makers of Kutikai take inspiration from the natural curiosity of children to produce innovative interiors that make a big statement, and the Kutikai Playhouse Desk does just that. From the “Roof” collection, the Playhouse Desk can be paired with adorable stools (sold separately for €110) to complete the set. Kutikai’s stunning furniture and accessories are designed and made in Poland. At this stage, we can only admire from a distance as there is no shipping to Australia – but we are keeping tabs and will update you when the stunning range heads our way.